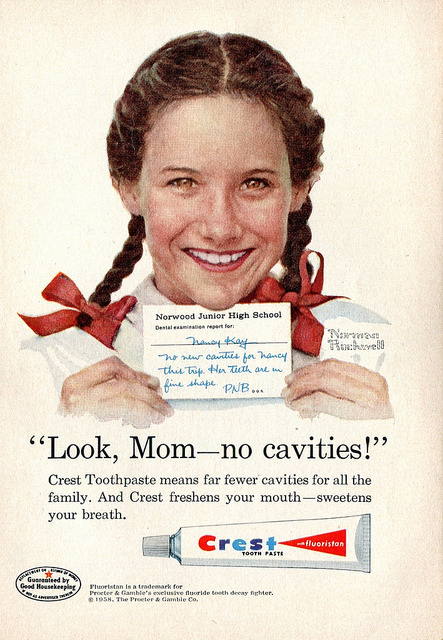 Busting the myths: "Baby teeth don't matter"
Back in 1958, when the first Baby Boomers were entering their teens, Crest toothpaste launched that irresistible tag line: "Look, Mom - no cavities!" Decayed teeth would be a thing of the past, thanks to better oral hygiene. This persistent myth seems perfectly reasonable. We shed baby teeth beginning around age 6 when pristine permanent teeth begin to emerge. Even if those baby teeth are brown from decay, the problems seem to go away. But the idea of a dental re-boot is misleading. Children need healthy baby teeth to eat, speak, smile and hold space for permanent teeth. Kids with early decay not only suffer needlessly, they are three times more likely to develop cavities in their adult teeth. That’s because tooth decay is a chronic condition caused by infectious (and shareable) bacteria. The bacteria thrive on the sugars we eat and drink, creating acids that attack enamel and cause cavities. The infectious cycle can be prevented, starting with baby teeth, and easily treated. The best returns on investment—in children’s health and in public and private health spending—are grounded in established science. No myths allowed.